Markus Neteler received his MSc degree in Physical Geography and Landscape Ecology from the University of Hanover in Germany in 1999. He worked at the Institute of Geography as Research Scientist and teaching associate for two years. From 2001-2007, he was a researcher at FBK-irst (formerly ITC-irst), from 2005-2007 also at Centro di Ecologia Alpina. From 2008 to 2016 he was employed at Fondazione Edmund Mach (FEM, Trento, Italy) as the coordinator of the GIS-Remote Sensing unit. Besides business develop for mundialis, his main interests are remote sensing for environmental risk assessment and Free Software GIS development. In his years in Italy, he has been working on risk mapping within EU and Italian projects related to eco-health and biodiversity (see above). He focuses on GIS analysis including open source software development and remote sensing to extract environmental indicators from spatial time series. He is author of a highly cited book, various book chapters, and over 70 peer reviewed publications; he is a referee for Agrometeorologia, Applied Vegetation Science, Boreal Environment Research, Computers & Geosciences, Ecology and Society, International Journal of Geoinformatics, International Journal of Geographical Information Science, Remote Sensing, Transactions in GIS, Remote Sensing of Environment and others. He is member of the scientific boards of various GIS related conferences. Markus is founding-member of the GRASS Anwender-Vereinigung e.V. (Germany, now FOSSGIS.de) and the Open Source Geospatial Foundation (OSGeo.org, USA). In September 2006, he was honored with the international Sol Katz Award for Geospatial Free and Open Source Software (GFOSS). In 2010, he earned the degree of a Doctor of Natural Science (Dr. rer. nat.) in Physical Geography. 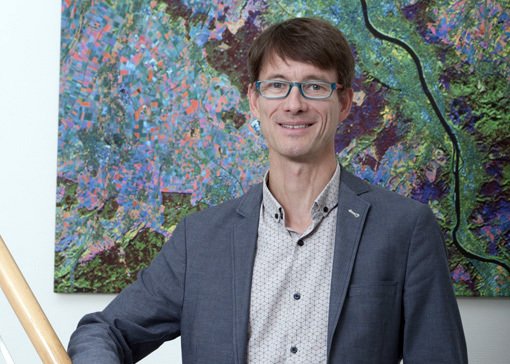 Markus previously worked as Head of GIS and Remote Sensing unit at Fondazione E. Mach, Trento, Italy (2011-2016). Activities in Geographical Information Systems (GIS) development and applications, remote sensing for the European projects, and the involvement of mundialis as an SME in H2020. Neteler, M., Bowman, M.H., Landa, M. and Metz, M. (2012): GRASS GIS: a multi-purpose Open Source GIS. Environmental Modelling & Software, 31: 124-130 [DOI] (IF: 3.476). In the Top25 Jan-Mar 2012 & Oct-Dec 2012; also #1 in Top25 all year; Highlight article in Elsevier Environmental Science & Ecology Newsletter of 2012. In the most cited all times! Neteler, M. (2010): Spatio-temporal reconstruction of satellite-based temperature maps and their application to the prediction of tick and mosquito disease vector distribution in Northern Italy. PhD thesis, Leibniz University of Hannover, Germany. 145 pp. Get as a printed book: in US or Europe or via Amazon! M. Neteler, 2003. GIS processing of MODIS and ASTER remote sensing data. Studio ITC-irst Per Universita‘ degli Studi di Trento, ASI/FRANE project, IRST Technical Report, 21 pp.